ROYAL HUNT was founded by Danish-Georgian multi-instrumentalist Andre Andersen in 1989. Numerous personnel changes have been a trade mark for the band, but also highlight albums like “Moving Target” and “Paradox”. Their peak period 1995 through to 1997 are sort of back now, with the strong voice D.C. Cooper and keyboardist Andre working together again, after a try-out short reunion tour earlier this year. The rest of the band consists of drummer Allan Sörensen, who´s been with the band since 1997, new boy guitarist Jonas Larsen and bassist Andreas Passmark (STORMWIND, NARNIA. ROB ROCK). 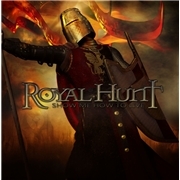 The info says this album will bring ROYAL HUNT back to the throne of the hard rock world, is that a fact? The cover hints at a crusader theme, and so does opener “One More Day”. But the good ole “Crusader-kikck” of SAXON is not there amongst all the pomp, female choir, or even the great bass line or nifty riffs. I´m a bit surprised to find “Another man Down” opening with a phone ringing, so much for the possible theme. But the refrain saves the day, swords swinging…or not! Naming a song “An Empty Shell” hints at confidence…because the song is closer to an empty shell than the rest. Andre makes his best mark in the 18ct influenced “Hard Rain´s Coming”. The cool elegance, the contagious neo-classism, the able musicians, everything makes for a worthy inclusion in the live environment. I wish they´d done more in the same vein. They flirt a little with the ESC in “Half Past Loneliness”, and they even attempt to resemble RAINBOW in album closer “Angel´s Gone”. The pace might be there, the neo-classism also, but the train has left. The songs are not of the right caliber, and far too uneven. The musicians shine, especially Andreas and Jonas, and D.C sure hasn´t left his voice behind…but this will not become a classic.